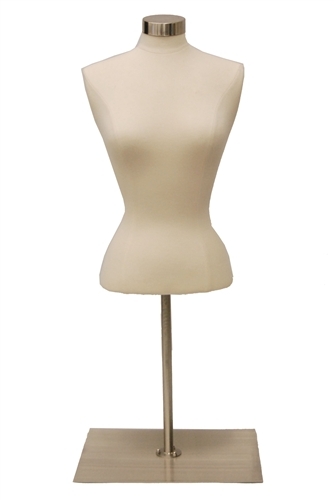 With a beige finish, this small sized upper torso form is perfect for any top and can make any designer top look great. Goes great anywhere inside a store. Come with your choice of base pole length for either floor standing or counter top. To see the matching male torso form to this female form - click here. Comes with flange to fit base. Metal Neckblock to match base also included - hanging loop on back of neck included.